Verification failed. We encountered an error looking up your site's domain name. Ajay Kumar Singh > Google Webmaster Central > Verification failed. We encountered an error looking up your site’s domain name. This is one of those simple errors/mistakes which can freak anyone out easily. 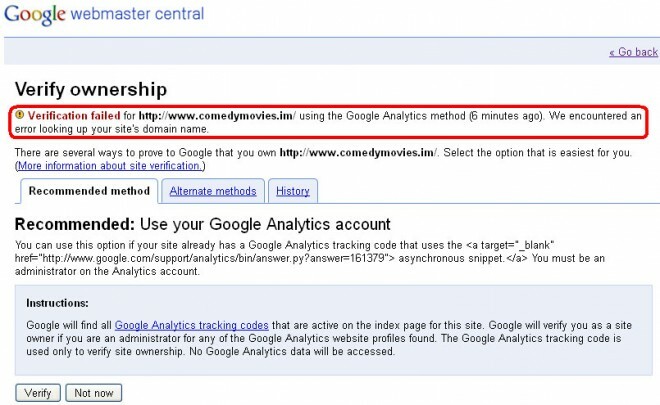 I’ve this Comedy Movies blog which I setup long time back but never bothered to check the Google Webmaster Central. Today I decided to check Webmaster Central and find out how this site is performing. To my surprise this blog was not even verified in Google Webmaster Central. I tried to verify the site, to my surprise, it wouldn’t verify no matter which method I try. I can see that Google Analytics is successfully tracking the site and there is no error. None of the above verification methods worked. I couldn’t find a solution to the problem anywhere. I checked the DNS zone file but nothing seems to unusual. There are other WordPress blogs on this host which uses same environment so I don’t see any reason why there should be any problem with DNS. Looking at the error – Verification failed. We encountered an error looking up your site’s domain name. – it certainly seems that there is a problem with the site’s domain name. Google is not able to resolve the domain name. I checked the domain name, spelling mistakes however all seems to ok. 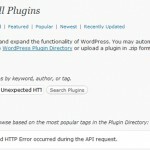 This is a typical WordPress installation and I don’t see any problem with the WordPress settings or Theme. This error is really getting into my nerves. I’ll keep updated if I find any solution to this problem. Finally found the problem. It was my fault. I have moved this domain to a new server and I was using /etc/hosts entry to access the domain on new server. I forgot to change the nameserves in domain registrar to point to new host and hence this problem. How did I manage to find out the solution? I asked someone else to see this website and he reported that he can’t access the website, which lead me to check the domain’s namesever and then I found the problem. The morale of mistake is that check your domain name setting properly. Sometimes a typo can also cause this problem. I have got similar problem for verifying it with google webmaster tools. If you have forgot to change nameservers to new host, then how is your website running in new server? I’m so confused. Here’s my real problem. I’ve changed nameservers to my new host. I can verify domain name of my main domain but I cannot verify name servers of subdomain. In my case I forgot to change the nameservers but I added IP address and domain in /etc/hosts file which resolved domain for me on my laptop. But this will not resolve domain to the public. In your case I can see your domain so it resolves properly. It might be that Google is still not able to resolve your domain. May be retry after few days. I can’t think of anything else.